Green beans, scientifically known as Phaseolus vulgaris, also known as French beans, Squeaky beans, string beans or snap beans, are a food item in the same family as black beans and kidney beans. They consist of a green pod with small seeds inside, and both are usually eaten together as a single unit. The term "string bean" comes from the preparation routine that involves removing a stringy piece of fiber from the back of each bean before cooking. Many newer strains of green beans don't actually have a string anymore, and the only preparation required is snapping off the ends. The beans are normally eaten fresh, and when purchasing them, it is generally important to choose beans of the highest quality. Most experts say that a bright green color is a good sign, and there shouldn't be bruises or any other noticeable flaws. The beans should generally be firm and crisp, and they should make an audible cracking sound when broken. It is important to store beans in the refrigerator until right before they are cooked, and it is a good idea to wash them before cooking. Most nutritional experts think green beans are a very healthy food item. They are generally high in important vitamins and fairly low in calories. The green bean is also relatively high in fiber, which can aid in digestion, and they have a lot of vitamin K, which can potentially help a person maintain sturdy bones. Some nutritionists believe that green beans could be very useful in the fight against heart disease. They have several vitamins that help reduce the amount of cholesterol that builds up in the blood vessels. 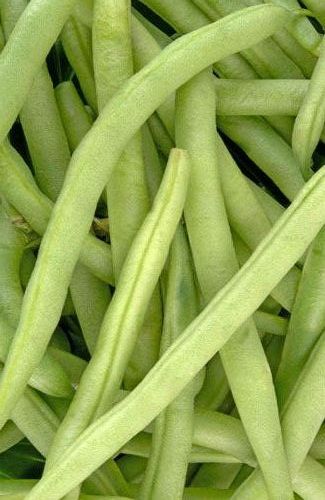 People generally cook green beans as a side dish or as a small part of a larger dish, and they are rarely used as a main course. In many cases, they are simply boiled in water with very little additional preparation. They are also used in a huge variety of different recipes from soups to casseroles, and different cultures have different approaches to their preparation. The green bean was first domesticated in the South American country of Peru by native tribes in the area. From there, they spread throughout the New World. In the 16th century, Spanish sailors returning from the Americas finally introduced the green bean to Europe, and it quickly became a popular food item. Eventually, they were spread all over the world. The green bean has gradually become more popular over time, and they are eaten in a wide variety of places. Green beans are highly beneficial to your body, due to their abundant nutritional value. If you are on a low weight diet or planning to lose weight, then you should include green beans in your diet. The healthiest form of fresh green beans is to boil them, but do not put salt. Fresh green beans can be easily identified by their soft and smooth skin, but free from black or brown spots. Speaking about the calories in green beans, one cup of green beans has two grams of protein, while fat content is less than one gram. They are a good source of dietary fibers too. These fresh beans also contain vitamin A and vitamin C. The daily recommendation of vitamin A and vitamin C present is 17% and 20% respectively. One cup of canned green beans contain 60 calories. The calorie is broken down to 58% fat, 38% carbohydrates and 9% fats. Canned green beans contains less amount of cholesterol. They are also good sources of vitamin A and vitamin C. These beans contain full of minerals like magnesium, calcium, potassium, copper and iron. Canned green beans are served only when heated and are used in many delicious dishes, soups and salads. They can be prepared by roasting them in olive oil with garlic and garnish them with red peppers. The table shows the nutrition values of canned beans. Canning green beans is less time-consuming and can be made at home. Green beans are good sources of vitamin A, vitamin C and vitamin K. Green beans contain beta carotene, which is found in Vitamin A. Vitamin A, a fat soluble antioxidant, helps control night blindness and other eye problems. Dietary fibers present in green beans are helpful in controlling the blood sugar levels. If you're suffering from diabetes and hypoglycemia, do incorporate green beans in your diet. Folic acid and vitamin B6 present in these beans, regulate the levels of homocysteine in the blood. Homocysteine is an amino acid that is produced, as an intermediate product of the metabolic process. Increased concentration of the homocysteine is seen in heart patients. Significant amounts of magnesium, copper, iron, molybdenum, potassium are also found in green beans. Intake of the individual minerals is essential in our daily diet. Anti-inflammatory properties of green beans are useful for asthma and arthritic patients. Green beans are also capable of lowering high blood pressure. Green beans are very rich in dietary fiber (RDA per100g 9%) can help smooth bowel movement and is useful for protecting the mucous membranes of the colon by reducing the time of exposure to toxic substances as well as by binding to cancer-causing chemicals in the colon. Dietary fiber has also been shown to reduce blood cholesterol levels by lowering cholesterol re-absorption of bile acid binding in the colon. Green Beans fiber also helps promote colon health because it has properties to bind cancer-causing toxins, removing them from the body before they can harm the intestinal cells. Green beans offer cardiovascular protection. As per your expectations, antioxidant support provided by green beans turned out to offer some cardiovascular benefits directly. Research on green bean associated with cardio involves animal studies in mice, and green beans can be proven to protect the heart. Vitamin C, in conjunction with the carotenoids, help to support the immune system and prevent cellular damage caused by free radicals. Free radicals are molecules that, when exposed to oxygen, damage DNA. Folate may help prevent DNA damage and cellular mutation as well. According to the National Cancer Institute, populations that consume diets rich in fruits and vegetables have a lower cancer risk, in part, due to their high carotenoid, vitamin A and C content. This protective benefit is particularly pronounced for cancers of the lung, gastrointestinal tract, breast, oral cavity, pancreas, uterine cervix, and ovary. Green beans are rich in all of these protective nutrients. You can always try growing green beans at home. Green bean seeds can be soaked for thirty minutes and then, place them six inches down into the soil. Loosely place the soil in such a way as to surround the seeds. Water the sown seeds at seven-day intervals. After ten days, see them growing. I hope, the green beans nutrition facts related above have really interested you to grow them in your garden. Green been can also cause allergic reactions involving rash and itching in some people. Green beans contain oxalic acid, a naturally occurring substance found in some vegetables which, may crystallize as oxalate stones in the urinary tract in some people. It is, therefore, people with known oxalate urinary tract stones are advised against eating vegetables belong to brassica and fabaceae family. Adequate intake of water is therefore advised to maintain normal urine output to minimize the stone risk.